His Legacy… Henry Clinton Satterfield, 93, passed away April 8, 2019. He was born on June 3, 1925, in Corning, Arkansas, to Henry Bishop and Myrtle (Phelps) Satterfield. Henry married the only love of his life, Maybelline (Smith) Satterfield, on March 24, 1947, in Piggott, Arkansas and was married for 72 years. He will be remembered as having the quickest wit of anyone on the planet. He loved to surprise you with a one liner. Henry also was an avid master gardener, he loved sitting under one of his apple trees watching his garden of fruits and vegetables grow. Aside from growing his garden, Henry raised a family and provided the perfect foundation in Jesus Christ and brought up people who loved the Lord as much as he did. His Family… Henry will be missed by his Spouse, Maybelline Satterfield; his children, Sheila Sue Ray, Pamela Jone (James) Henry, and Kellie Jo (Danny) Satterfield-Herrera; sister, Alice Thornton; grandchildren, Sam Patterson, Danny B. Bigelow, SueAnne Lewis, Erich Ray, Bryan Ray, Tanya Okenka, and Joshua Piazza; great grandchildren, Danny Bigelow, Gage Bigelow, Reece Bigelow, Mason Bigelow, Jack Bigelow, Kendan Lewis, Angel Piazza, Ariana Piazza, Jacob Okenka, Maddie Okenka, Sammy Patterson, Steven Nichols, Zack Nichols, and Samantha Nichols. He is preceded in death by his parents; his son; Dewayne Satterfield; his daughter, Diann Patterson, sons in law; Danny Ray and Sam Patterson, and granddaughter; Stacie Nichols, and several siblings. His Farewell… Henry’s family and friends will gather April 11, 2019 from 5:00-8:00pm at Borek Jennings Funeral Home, Hamburg Chapel. 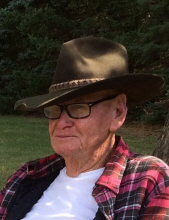 His Community Farewell will be held on April 12, 2019 at 11:00am (10:00am gathering) at Borek Jennings Funeral Home, Hamburg Chapel. Pastor Ken Warren will serve as celebrant. Memorial contributions are suggested to St. Joseph Mercy Hospital. Please leave a message of comfort for Henry’s family at 1-877-231-7900, or sign his guestbook at www.borekjennings.com. To send flowers or a remembrance gift to the family of Henry Clinton Satterfield, please visit our Tribute Store. "Email Address" would like to share the life celebration of Henry Clinton Satterfield. Click on the "link" to go to share a favorite memory or leave a condolence message for the family.